If you are a bargain hunter like me and don't like paying full price for kids stuff when they will just outgrow them in the blink of an eye then you are going to love Trunk Show Kids, an online children's boutique that sells overstocked, out of season, factory second and sample designer children's clothing and accessories at 20-80% off RRP. It is owned by a mum with two kids of her own who understand how difficult it can be to shop with children let alone hunt for bargains and this was the inspiration the online store - you can shop for bargains in the comfort of your own home. 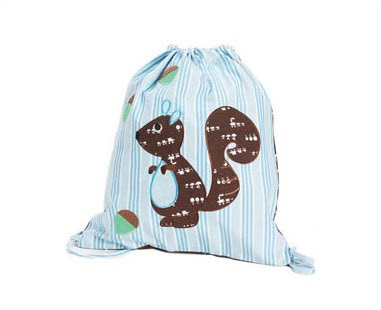 Trunk Show Kids are kindly offering ish & chi readers a prize of a Cocoon Couture Cheeky Squirrel Kinder Bag. The giveaway is open to all ish & chi readers worldwide. To enter, simply leave a comment on this post by 5pm Wednesday 16 December 2009 EDT. The winner will be randomly selected and posted on ish & chi Thursday 17 December 2009. Trunk Show Kids are also offering Australian and New Zealand readers a 10% discount storewide. The offer is valid for 1 week (ends Wednesday 16 December 2009) and all you need to do is enter "ish special" in the coupon box on checkout to claim the discount on your purchase. Check out the store for current specials and sign-up for the newsletter so that you can get first "dibs" on the bargains as they arrive. Update: Entries closed. I'll announce the winner tomorrow morning. Thanks!